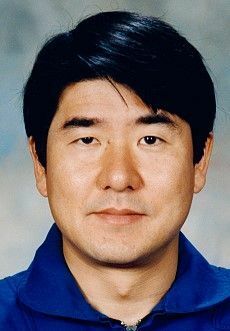 Japanese engineer mission specialist astronaut 1985-2009. Status: Inactive; Active 1985-2009. Born: 1954-09-18. Spaceflights: 2 . Total time in space: 31.45 days. Birth Place: Minamitama, Tokyo. Educated as aerospace engineer, University of Tokyo. Born September 18, 1954 in Minamitama, Tokyo, Japan. Married to the former Hitomi Abe of Toukamachi, Niigata, Japan. He enjoys flying, soaring, playing tennis, jogging, soccer, and observing stars as an amateur astronomer. Graduated from Ousaka-phu, Mikunigaoka High School in 1973. Bachelor of engineering degree from University of Tokyo, 1978. Master of engineering degree from University of Tokyo, 1980. Doctorate in aerospace engineering from University of Tokyo, 1983. The Japan Society of Microgravity Application, the Japan Society for Aeronautical and Space Science, American Institute of Aeronautics and Astronautics. Received Minister of State for Science and Technology's Commendation, Science Council of Japan's Special Citation, and National Space Development Agency of Japan's Outstanding Service Award in 1992. Published over 40 papers in the areas of chemical propulsion systems, electric propulsion systems, fluid dynamics, and microgravity science and technology. Takao Doi studied space propulsion systems as a research student in the Institute of Space and Astronautical Science in Japan from 1983 to 1985. He worked for the National Aeronautics and Space Administration (NASA) Lewis Research Center as a National Research Council research associate in 1985. He joined the National Space Development Agency (NASDA) of Japan in 1985 and has been working in the Japanese manned space program since then. He conducted research on microgravity fluid dynamics at the University of Colorado from 1987 to 1988, and at National Aerospace Laboratory in Japan in 1989 as a visiting scientist. In 1992, he served as a backup payload specialist for the Spacelab Japan mission (STS-47). In 1994, he worked as a project scientist on the International Microgravity Laboratory 2 mission (STS-65). Dr. Doi was selected by NASDA in 1985. He participated in payload specialist training from 1990 to 1992 in preparation for the Spacelab Japan mission. He reported to the Johnson Space Center in March 1995. On completing a year of training and evaluation he was assigned technical duties in the Vehicle Systems/Operations Branch of the Astronaut Office. Dr. Doi will serve as a mission specialist on the crew of the fourth U.S. Microgravity Payload flight scheduled for an November 1997 launch on board Columbia on mission STS-87. During the 16-day mission Dr. Doi will become the first Japanese astronaut to conduct a spacewalk. Family: Astronaut. Country: Japan. Spacecraft: ISS. Flights: STS-81-G, STS-87, STS-123. Projects: STS. Agency: NASDA. Bibliography: 12, 5329. 1954 September 18 - . Birth of Dr Takao Doi - . Nation: Japan. Related Persons: Doi. Japanese engineer mission specialist astronaut 1985-2009. 2 spaceflights, 31.4 days in space. Flew to orbit on STS-87 (1997), STS-123..